For the delicious Mrs. E and me, Valentine’s Day present something of a dilemma. Should we stay in and have a delectable dinner with very good wine? Alone or with friends? Should we trust ourselves to a restaurant? (after New Year’s Eve, I’m a bit wary.) Should we forgo presents to buy another painting? This year, I’ve started off on an optimistic note. I’ve ordered a case of organic, sparkling pink wine… I’ll let you know the details after the first bottle has been opened. Now the question is: do we share with friends? After all, if it weren’t for a mutual friend we would never have met. Well, we’ll figure it out. In the meantime, if you are single or not dating, or jaded, consider this an opportunity to loose a little easy elegance into your world. Throw a party. One of the best ideas for a party — ever — came from our friend, The Architect. He would throw an annual Valentine’s Day Party. The response was always tremendous and the parties were legendary. Did he eschew all things romantic? Not in the least. He had all the trappings, flutes of champagne, silver trays of chocolate dipped strawberries, lush red roses in sparkling crystal vases, polished silver, linen napkins… Add a little Gershwin, Lady Day and Mr. Francis Albert Sinatra and you’ve got an evening to remember. 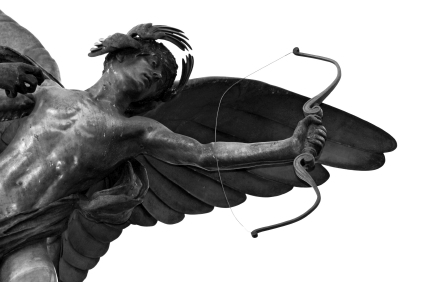 This year, play cupid for your crowd. If you hurry, there’s just enough time to order your invitations. This entry was posted in Entertaining and tagged Entertaining, holiday, parties. Bookmark the permalink. New Year’s Eve and Valentine’s Day are amateur night! The professionals know not to go out then! Ha! I can believe it. It’s the criminal inflating of prices on bottles of bubble that really gets me. Even the stores! Hello Elegant! Had oysters and champagne this weekend and I thought of you. I know not everyone is a fan, but I adore Valentine’s Day and while we normally celebrate just the two of us, sometimes out, and sometimes at home, the idea of a Valentine’s party sounds charming. And do let us know about the organic pink sparkling wine! Hello TIG! Thank you for thinking of me. Had oysters and champagne at lunch earlier this week. Ah, the perks of self-employ. I’m glad to hear that you’re a fan of Valentine’s Day, too. I think we’ll settle in to watch “Some Like It Hot” and polish off a bottle of the pink stuff in the process. Mrs. PVE, a fine word picture you’ve painted. Me, too! One of my all-time favorite Valentine’s Days was the first year I lived in Washington, DC. My roommate and I threw a party for all of our girlfriends – single or not – the weekend beforehand. Why, we wondered, should Valentine’s Day celebrations be reserved for only romantic love? We had endless bottles of wine, a fire in the fireplace and fresh cookies baking in the oven. It was an enormous hit and created mulitple new friendships. Today, my husband and I typically cook an indulgent meal together on Valentine’s Day and let the amateurs fight the crowds and pre-fixe menus. Welcome Ms. Fever! And that’s a fine idea for a party. And for an evening. I believe that Mrs. E. and I will indulge in a sinful meal ourselves.